Thousands of homeless street dogs and even stolen family pets have been brought from all over China to Yulin for slaughter. Defenseless animals have been burned, butchered and boiled alive to feed the festival's attendees. Please speak out against this atrocious event by using the hashtag #StopYulin2015. 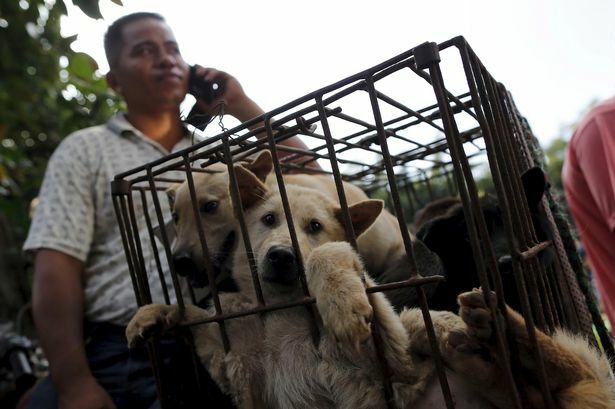 An annual dog meat festival in south-west China has begun, amid uproar on the part of animal rights activists. About 10,000 dogs will be slaughtered for their meat at the Lychee and Dog Meat Festival in Yulin in Guangxi province on Sunday and Monday to mark the summer solstice, state media said. One retired school teacher from Tianjin hit the headlines when she purchased dozens of dogs to save them. Residents and vendors in Yulin say the animals are killed in a humane way. Activists say the killing is cruel and an online campaign to ban the festival has been signed by more than 3.8 million people so far and the campaign has attracted considerable support this year from celebrities both domestic and foreign. Celebrities including British comedian Ricky Gervais have spoken out on Twitter with the hashtag #StopYuLin2015. Chinese pop star Chen Kun and actor Yang Mi have said they are joining the campaign on micro blogging site Weibo. And Chinese actor Fan Bingbing and others posted a video online against the festival. The festival began a few years ago according to state media. The tradition of eating dog meat dates back four or five hundred years in China, South Korea and other countries, as it is believed to ward off the heat of the summer months, according to state news agency Xinhua. However, this festival began in recent years, Xinhua said. City officials have distanced themselves from the gathering. "Some residents of Yulin have the habit of coming together to eat lychees and dog meat during the summer solstice," the city's news office wrote on Weibo. "The 'summer solstice lychee and dog meat festival' is a commercial term, the city has never [officially] organised a 'dog meat festival'," it added. As in recent years, some animal lovers resorted to buying some of the dogs in order to rescue them. Yang Xiaoyun, retired school teacher, paid about 7,000 yuan ($1,100; £710) to save 100 dogs on Saturday. The BBC's Celia Hatton in Beijing says this kind of dispute puts the government in a really difficult position. The glorified consumption of dog meat generates a lot of negative foreign media reports, embarrassing the authorities. Also, the dog meat industry has been accused of many underhand tactics, including the illegal capture of family pets to use as food. But at the same time, the government is wary of the increasingly sophisticated animal rights movement, she adds. Animal rights activists in China have formed a cohesive network on social media that extends to many foreign animal welfare groups. China's leaders do not want to encourage such a movement amid a wider crackdown on civil disturbance of any kind.